From Granville Island Brewing out of Vancouver comes their new “Swing Span Amber Ale” the first beer in their new Under The Bridge Series. This series has been created to celebrate the breweries 30th anniversary. This new recipe was created by the brewmaster Vern Lambourne from the Granville Island location but brewed by the parent company Molson. The beer pours an amber colour with a small tan head. The aroma consists of tropical fruits, citrus fruits, malts and caramel. The flavour is of big malts and caramel with tropical fruit, citrus and a decent amount of hops bitterness for a finish. The alcohol content comes in at 5.6%. This has to be the best standard bottle beer that Granville Island Brewing produces. It is right in line with all of the bomber bottle releases! Commercial Description: Vancouver, BC – Making great beer “under the bridge” (UTR) since 1984, Granville Island Brewing is celebrating our 30th birthday by paying tribute to the uncompromising roots of our home turf. 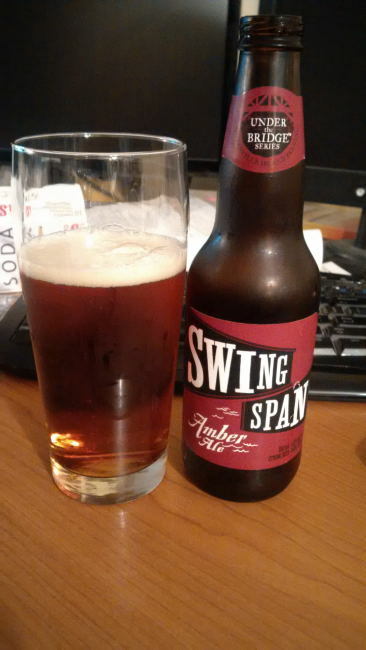 We’re thrilled to introduce the new Swing Span Amber Ale. “Swing Span’s a perfect brew to toast to Dirty 30,” says GIB brewmaster Vern Lambourne. “It’s a medium-bodied, deep amber ale that’s rich with aromas of premium Mosaic and Cascade hops. With Swing Span, we’re living on the edge without neglecting what’s made our beers so special for 30 years: premium brewing, all-natural ingredients and our irreverent Left Coast attitude.” Way back when, Granville Island was the industrial heart of Vancouver. Daring workers pushed themselves to their limits in gritty factories serving the forestry, mining, construction and shipping sectors. Until 1950, Granville Island operated beneath a swing span bridge that opened up whenever a tall ship sailed through. Today’s Granville Island is one of the city’s top destinations for tourists and locals alike—home to markets, artisans and, of course, Granville Island Brewing. 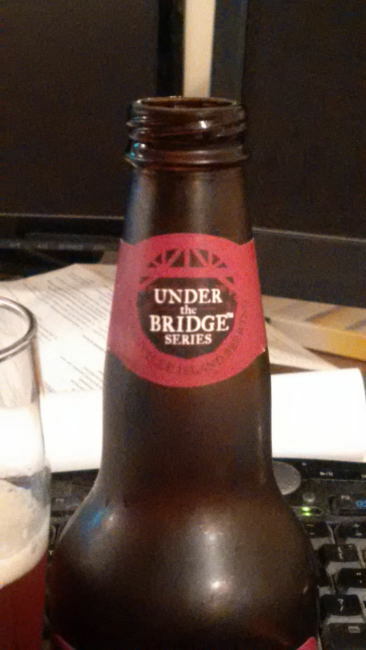 A nod to our heritage, Swing Span Amber Ale is part of Granville Island Brewing’s new Under the Bridge series, where every beer experience is a trip down the road less travelled to a destination of delectable discovery. Available in six-packs or on tap at your favourite bar or restaurant, Swing Span is assertive enough to pair well with spicy and savoury flavours or an exciting exploration on its own. Sound the horn for Swing Span! Make things. Do things. Craft things. Brew things. That’s what we’re all about on the Island—always has been. Get Under the Bridge: It’s good to be here. This entry was posted in Amber Ale and tagged amber ale, bc, beer, big malt, big malts, bitter, bitterness, canada, caramel, citrus, granville island brewing, hopped, hops, hops bitterness., hopy, malt, malts, malty, swing span amber ale, tropical fruit, tropical fruits, under the bridge, vancouver. I like what GIB is doing these days, they seem to have found a way to play in both markets nicely. Giving the local brewers a bit more creativity and therefore creating some really good beer, while still producing their regular lines in other places. It’s nice that the regular lineup is getting tasty too though.